I took a bike ride to Bank of America to deposit some cash (it actually counts the bills! So cool). My plan was then to ride to the grocery store 1/2 block away, then hit the liquor store on the way home. Abscent minded, I just left the bank and started heading home. I remember right away so I swerved down some side streets to find my way back. I did and when I came out in the parking lot I remembered (and saw) that the old K-Mart was now a Big Lots and a Savers. I vaguely remembered "isn't Savers a thrift store....?" when I saw that it was on the sign. 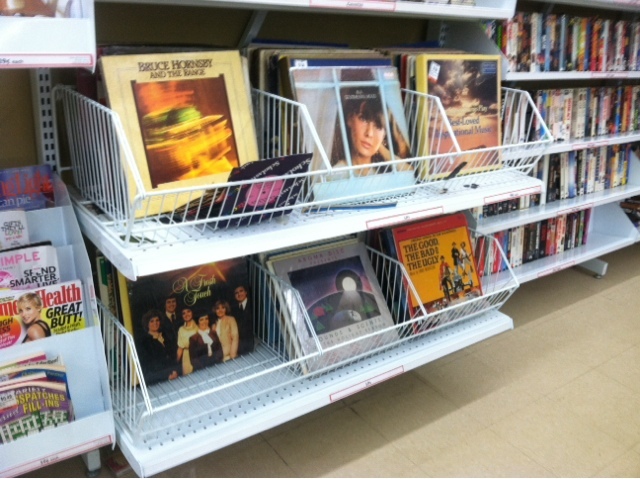 Was shocked to see that there was a rack of record just inside the door! Above it was a bunch of 8-tracks including a 3-tape Engelbert set. There were 2 others as well for a grand total of 5 tapes and 3 total compilations. But back to the vinyl. I ended up leaving with a B.J. Thomas record for $1.07 with tax and its in great shape and is excellent musically. The top seam needs to be reglued but thats no problem. Totally unexpected vinyl search that paid dividends and was a lot of fun!